We sell Cultured Foods products like Ruby Red Raw Sauerkraut - 400g online in the UK and directly from our award-winning store in Scotland. This raw sauerkraut is unpasteurised sauerkraut containing lacto bacteria. A versatile condiment to be enjoyed with any meat, fish, cheese or salads. This red raw sauerkraut is unpasteurised sauerkraut containing lacto bacteria. A versatile condiment to be enjoyed with any meat, fish, cheese or salads. We sell real Cultured Foods and other Spreads, Sauerkraut & Yogurt directly from our shop in Scotland and online throughout the UK. View more products from Cultured Foods. Where can you buy real Raw Sauerkraut - Ruby Red safely online? If you are wondering where you can buy Ruby Red Raw Sauerkraut - 400g safely online in the UK, then shop with us. 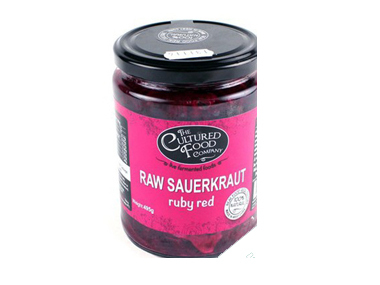 Raw Sauerkraut - Ruby Red - Ruby Red Raw Sauerkraut - 400g in Spreads, Sauerkraut & Yogurt and Chilled Foods.